Tepebo farms is situated on approx. 4 plots of land, and presently, it runs mainly as an aquaculture enterprise. The farm was established in 2011 with a capacity of 3 ton catfish production annually but by 2015, we expanded to 30 tons annual production. Presently, we have 17 concrete ponds, fish processing shed, water storage facility, smoking kilns and a standard hatchery system. At Tepebo farms, we have designed a staggered stocking system which enables us to produce table-size catfish every month. The farm has been able to expand through a continuous re-investment of retained profit and this has given us the opportunity to build and operate a modern hatchery that meets the farm's need and and also provide high quality fingerlings for local farmers thereby adding to our product line. Tepebo farms also started processing of catfish into Smoked fish. Thanks to the federal government (FMARD) for gifting us with three standard smoking kiln, now we produce ready to eat / smoked to taste catfish for our ever increasing consumers. 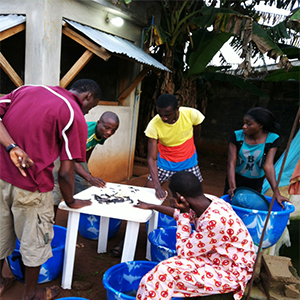 It is in consideration of the need to tap these potential, generate employment, improves socio- economic status of many young Nigerians that TEPEBO FARMS with the support of the government/interested private sector has proposed to establish a SKILL AQCUSITION CENTER to train and produces new generation of farmers and employers of labour. Our Vision: To produce high quality, affordable aqua-cultural products ranging from fingerlings, juveniles, table size fish, and package smoked fish to meet both local and international market. In doing this, we have leverage on best international practice considering our environment as “common wealth” for us now and generations coming.